You can create an iBooks Author widget for use in your iBooks Author projects. For example, you can create a widget that allows users to stream video from the Internet, draw using their finger, or interact with a timeline. Support for applying CSS filters as well as image and gradient masks to objects. Adobe Edge Reflow: After giving us a look at its new responsive design tool Adobe Edge Reflow in September, Adobe is finally releasing the first public preview free of charge to all Creative Cloud users. Adobe said the tool provides designers with the ability to create responsive layouts and high-fidelity web designs using CSS, a resizable design surface, and real-time previews with Edge Inspect. Users will also be able to extract the CSS for use in Dreamweaver, Edge Code, or another editor. Adobe detailed today’s public release in the video above. Adobe Edge Animate: Today’s update to Edge Animate brings new features, including: “gradients, CSS filters, and enhanced font support.” Adobe highlighted new CSS capabilities that consist of the ability to style and animate linear and radial gradients, new CSS filters such as blur, greyscale, brightness, contrast, sepia, and saturate filters, and a visual web font selector to add typography and live preview web fonts. 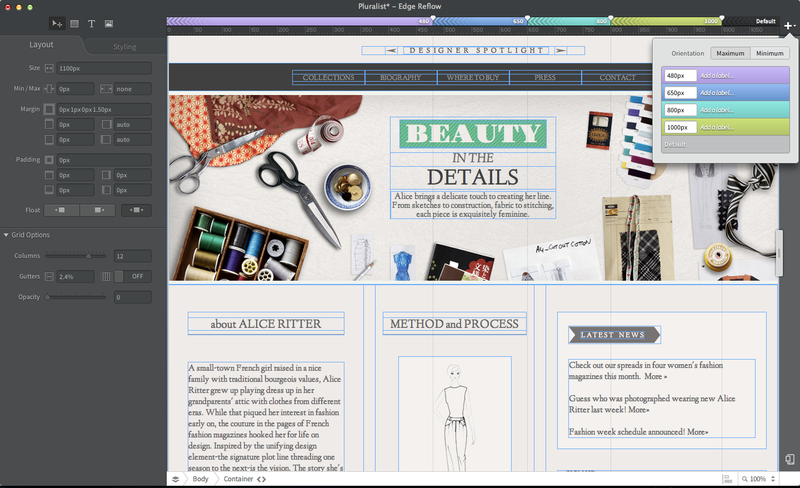 Adobe Dreamweaver: As for Dreamweaver, Adobe has updated the app exclusively for Creative Cloud members to bring integrated access to typography and a new fluid grid layout. 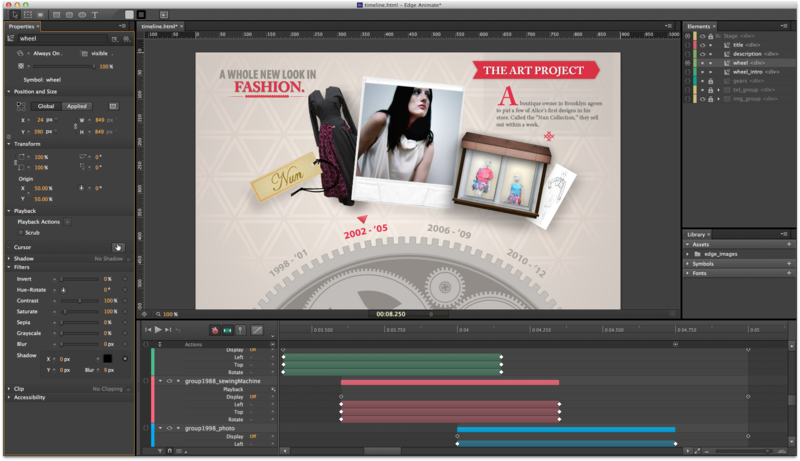 The fluid grid layout feature was first introduced in Dreamweaver CS6, but it now includes “class tags in addition to ID tags” and a new editing UI. 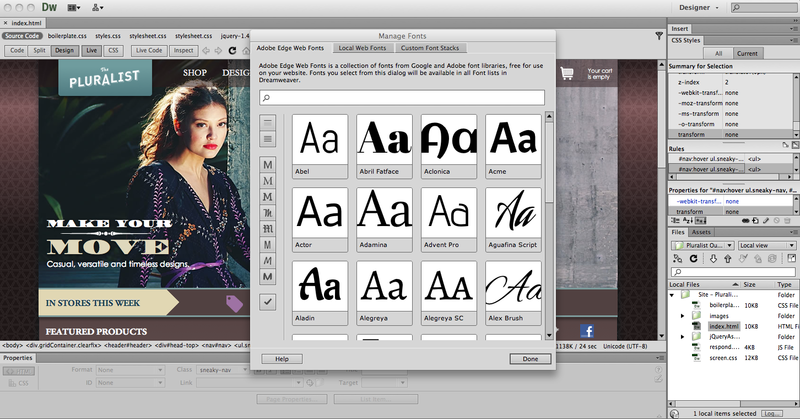 Users will also be able to preview and select Edge Web Fonts in Dreamweaver. We told you about a service called Kickfolio in December that would allow developers to demo their iOS apps directly in the browser using a new HTML5-based platform. The service converts a zipped version of an iOS app into a private test page with a completely interactive HTML5 and CSS version of the app. Today, the service got a few updates including the ability to embed app demos on any webpage using an iframe. You’ll find embedded iOS apps above and below that Kickfolio sent over for us to try. Kickfolio also now supports iPad apps, and it is making the service much more affordable for all. This is a powerful tool for developers promoting their apps online, and it’s one I expect many to take advantage of when providing free demos to potential customers and press on their website. Kickfolio originally had some feedback for users about plans starting at $50 a month. The good news: the company just slashed the cheapest plan to $9 a month (that includes 500 embed sessions). Every plan now also includes unlimited apps, and the company is reopening 15-day free trials so everyone will get a chance to try the new features. Just launched this week, Kickfolio is a new HTML5-based platform that allows developers to test and share builds of their iOS apps in the browser. Developers simply upload a zipped version of their app (no SDKs or changing code), and the service spits out a link to a private test page displaying an interactive HTML5 and CSS version of the app controllable by mouse and keyboard in portrait or landscape. Testers will also be able to leave feedback and interact with testers in a comment section on the page. Kickfolio has an example of the Angry Bots iOS app from Unity Technologies on its website here. A pro version of the service also includes a feature to embed apps that allows users to insert the interactive apps in press releases, websites, and elsewhere. The company has a 15-day free trial available, but is also offering pricing ranging from $50 a month for one to two apps to $300 a month for unlimited apps. You can learn more and create an account on the company’s website here.